L to R: Graeme Bartlett, Clyde Scott, Peter Common and Bruce King. Auckland pop singer, Clyde Scott was the first signing for a record label called Audion. This label had been set up by a couple of University students and it stood for 'Auckland University Disc Incorporated On November'. His backing group was made up of some of his friends and they called themselves the Senators. Along with Clyde on vocals, the group consisted of Graeme Bartlett on guitar, Peter Common on piano and Bruce King on drums. The first record to be released by the Audion label came out in 1959 and had Clyde Scott with the Zanyopolis on the A-side singing "Grave Digger's Rock". The B-side was a song called "Cool 'n Crazy" by Ron Maxman and the Martians, who were actually the same combination as the A-side, who were really the Senators. Clyde appeared at the Showtime Spectacular held at the Epsom Showgrounds on February 3rd 1960, along with Ronnie Sundin and Toni Williams and the Tremellos. The Senators used to play each night at the Majestic Theatre in Queen St, during the opening screenings of Fabian's first 'rock' movie, and because of their popularity they also got a lot of work providing backing for many of the touring overseas artists, with Clyde doing the compere duties at many of the shows. The second single in 1959 was "Bluebird"/"Treasure Of Love", this time attributed to Clyde Scott and the Clansmen. This was also the second single on the Audion label. 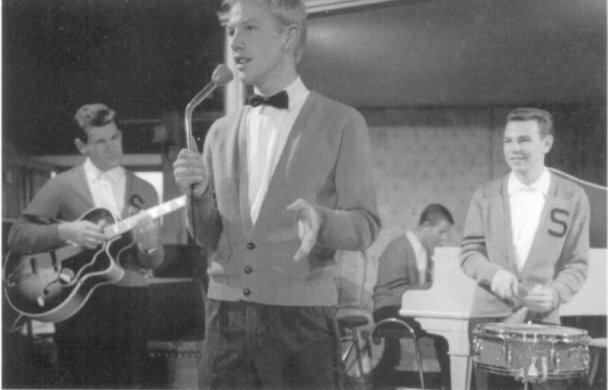 At the end of 1959, Graeme Bartlett and Bruce King became members of the Stereotones. Graeme Bartlett went on to a more famous career as Gray Bartlett. King was well respected as one of the countries best known session drummers. He also became a member of the Embers and the Mike Perjanik Band. Meanwhile Clyde continued as a soloist, but slowly moved away from live rock and roll performances. In 1961 he released a single on the Lotus label called "So Sad (To Watch Good Love Go Bad)"/"Lucille" and followed this the same year with another on the La Gloria label called "When The Time Is Right"/"You'll Never Walk Alone". In 1962 Clyde became a television host when he replaced the original host on "In The Groove". From there he hosted "Teen Scene" and "Swinging Safari", and then retired from the music scene to become very successful in the advertising field.